On Monday I attempted to shed a little light on the sort of man Edvard Beneš was and the role he played in the Heydrich assassination. Today I’m taking a look at Heydrich himself. There has been a lot written about Heydrich; two books in particular that I’m drawing from are (again) MacDonald’s ‘The Killing of SS Obergruppenfuehrer Reinhard Heydrich’ and Mark Roseman’s ‘The Villa, the Lake, the Meeting: Wannsee and the Final Solution’. There’s also a pretty good examination of Heydrich here. Heydrich was not a likeable fellow. The son of a poor musician, he was a social outcast almost from the beginning. Other children picked on him because he was a pigeon-chested pansy who was rumoured to be Jewish. He responded by becoming a ruthless and bloody-minded athlete and womaniser who was pathologically anti-semitic. There was a lot of that sort of behaviour going around. After World War I, it became fashionable in Germany to blame the country’s defeat on Jews. 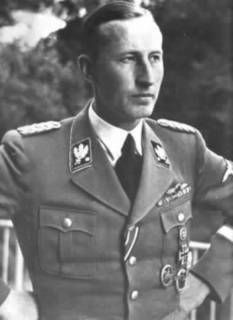 Heydrich’s involvement in militant nationalist organisations began when he joined the paramilitary Maracker Freikorps at 15. He eventually became a naval officer but was discharged in 1931 for bad behaviour; womanising again. His pride and career prospects wounded, he joined the Nazi party. He would seek his revenge on the officer class later. Heydrich made a great Nazi, as it were. He was an ambitious climber, continually scheming against those above and below him. He built up the Nazis intelligence wing to dig up dirt on people who got in his way. Anti-semitism was reaching manic proportions. To be called a Jew was accusation, trial and sentence. Such accusations were useful to monsters like Heydrich. Of course, rumours of Heydrich’s own Jewish past continued to linger, and he responded by trying to be the most ruthless anti-semite around. He wasn’t the only one. The Nazi machine in general and the SS in particular get painted as monstrous models of calculation and efficiency. True, they made the trains run on time and could devote enormous amounts of resources to inconceivably grim statistics, but it was because every individual knew that slacking meant personal ruin of the worst sort. (It’s interesting to note that when the Jewish charge didn’t stick, there was always the accusation of homosexuality.) So when a Nazi couldn’t be efficient and exacting, he went to extra lengths to be brutal, to show his heart was in the right place, sorta. Many people associate Heydrich with the infamous conference at Wannsee in January 1942. The common understanding of that conference has it that this was where the ‘Final Solution’ was unveiled and that Heydrich was in charge, but I think that’s putting too fine a point on it. As Roseman writes, Nazi policy was not established by anyone other than Hitler, and Hitler was not at Wannsee. Murderous opinions and plots were undoubtedly discussed, but we can’t know for sure because Heydrich wouldn’t let anyone except Adolf Eichmann take notes. Furthermore, Eichmann’s notes apparently look more like an essay, not minutes of a meeting. So Wannsee emerges as an opportunity for Heydrich to impress a bunch of Nazi middle-managers not just with how deep his anti-semitism ran, but with how ruthless and controlling he could be. Read Roseman for more. Even when he was SS Obergruppenfuehrer, Heydrich had set his sights higher. Just how high he hoped to climb in the Nazi organisation we don’t know, but he saw his path there as leading through Bohemia and Moravia. In 1941, the Reichsprotektor was Konstantin von Neurath, an old-guard army man who distrusted the SS. Heydrich wanted to turn the Protectorate into a model SS state. To that end, he compiled a dossier on Neurath’s administration. He sexed-up the dossier to make the Czech underground resistance to look like more of a threat than it actually was – just as Beneš was doing, but for completely different purposes. So when Beneš’s boycott of the Protectorate press came off, Heydrich pounced. Within a week, Hitler named Heydrich to replace Neurath. The new Reichsprotektor immediately declared martial law and raised the black SS flag over Prague Castle. He set about expediting the execution of hundreds of suspected resisters, many of whom were intelligentsia and former army offices, to eliminate any potential resistance leaders. At the same time, he increased some rations, distributed shoes and took other measures to depoliticise the Czech population and get individuals to concentrate solely on their jobs and material needs. Heydrich arrested Prime Minister Alois Eliáš as a traitor and sentenced him to death, but postponed the execution and let it be widely known that further testimony could be expected from the doomed man. This put the fear of god in many officials who were quietly resisting the Nazis, including the aged and ailing president, Emil Hácha. The president eventually denounced Beneš and accused him of being a troublemaker who did not have the interest of the people at heart. It’s unclear what effect the underground’s ‘undetectable sabotage’ was having on industrial output, but it seemed to be in everyone’s interest to inflate the damage caused – well, everyone’s interest except that of ordinary people and what remained of the resistance after Heydrich launched his initial reign of terror. While Neurath had been loathe to punish the entire population for the actions of a few, and thereby push the country toward rebellion, Heydrich decided to shock and awe the Czechs by executing 3000 men. It was an act that Beneš felt he had to answer. quick question, when you used hello.com for your photo, did you type your post directly into their program under caption or what? Hello will put the image at the top of your page as a new post. You can then edit that post, copy all the code and paste it in the appropriate post. You can then go back and delete the post Hello created.